This is a collection that the moment I saw the previews I knew I wanted ALL OF IT. 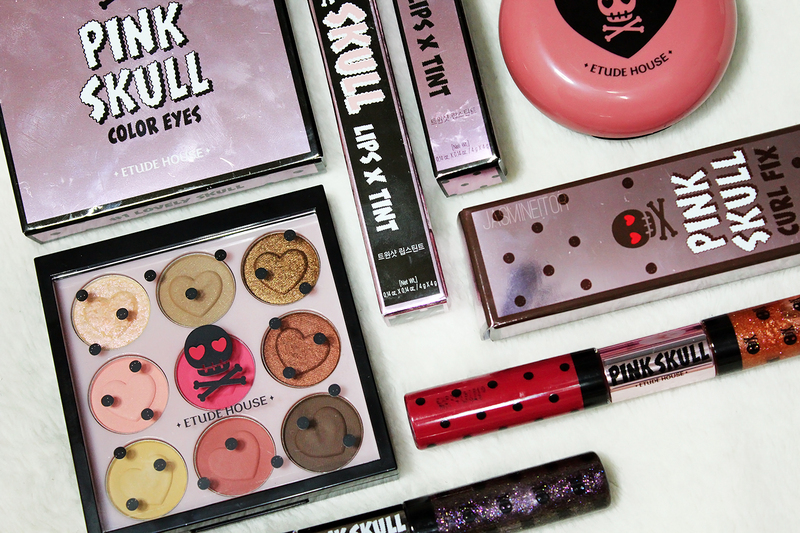 Cute/creepy is my aesthetic and pretty much everything I own has skulls on it, so I love the packaging of this collection! 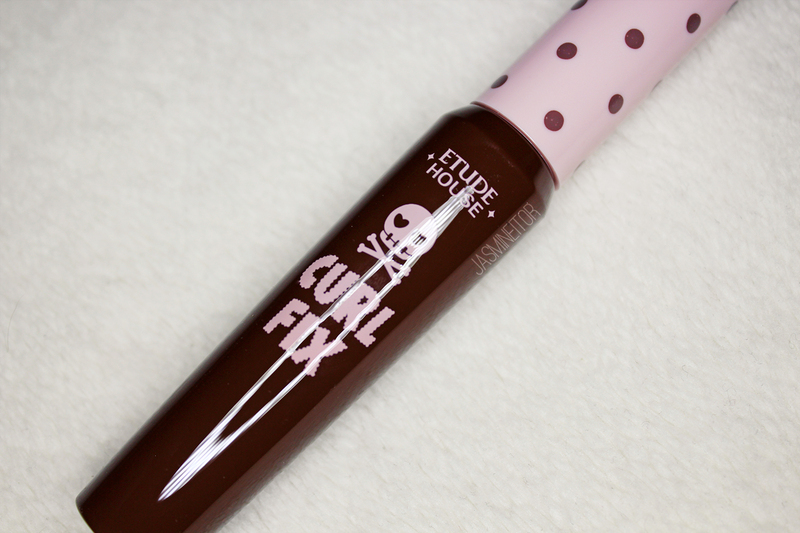 I own the original Curl Fix in black and pink, and the Curl Fix long lash, but this is my first brown mascara! 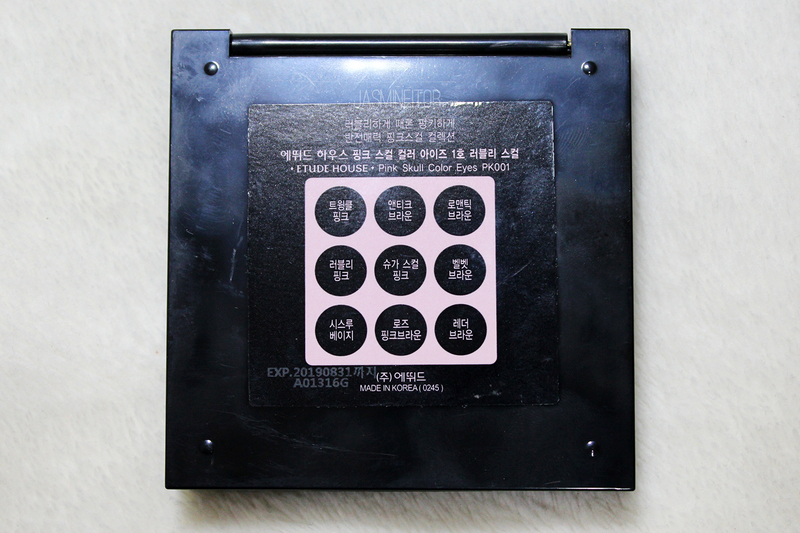 I’ve seen some Korean beauty bloggers use these to soften their eyes, and I quite like the diffused effect it gives your lashes. Like the regular Curl Fix, the wand comes in the two-step method. 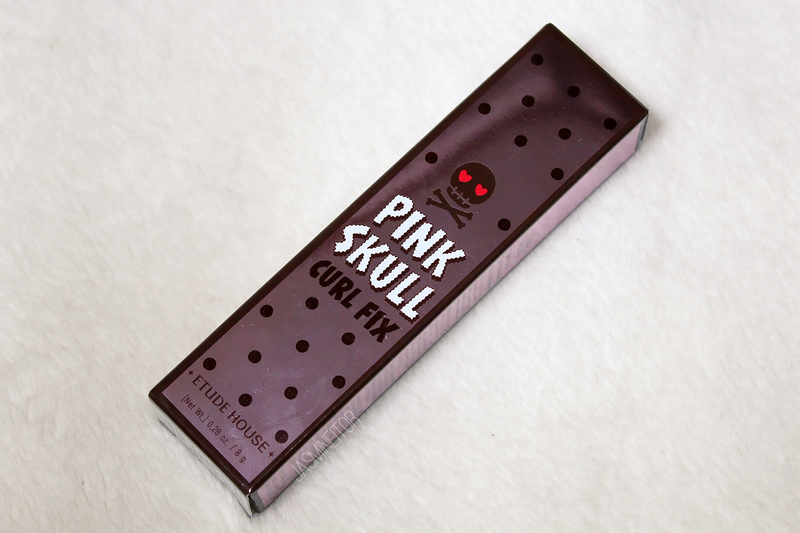 If you want to read more on this, you can read my review on the original Curl Fix here. 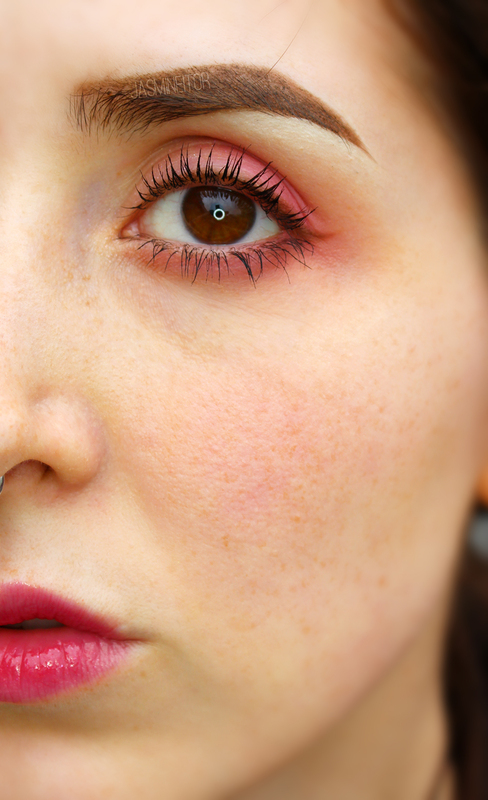 I applied the brown mascara on the upper lid, and black on the bottom so you can see the difference in colour. 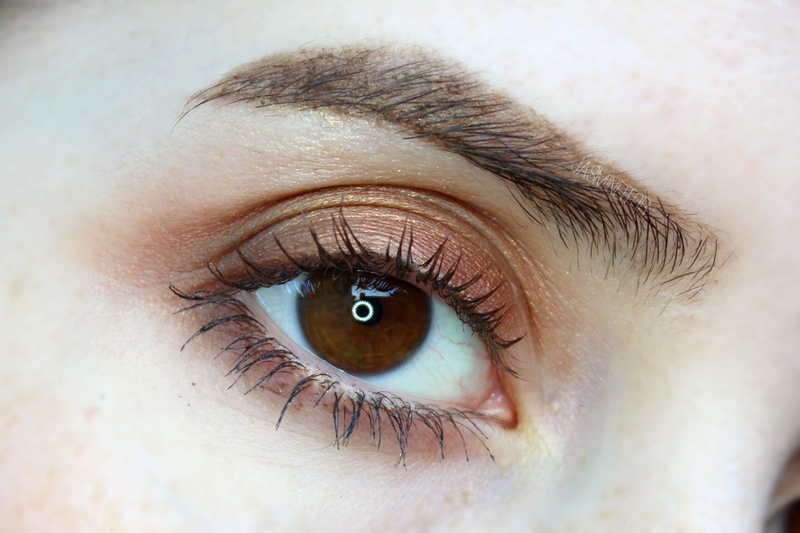 I also used Velvet/ Romantic/Leather Brown from the palette for this look! Personally I prefer a more volumizing mascara, but I do like the colour, and the curl lasted all day. 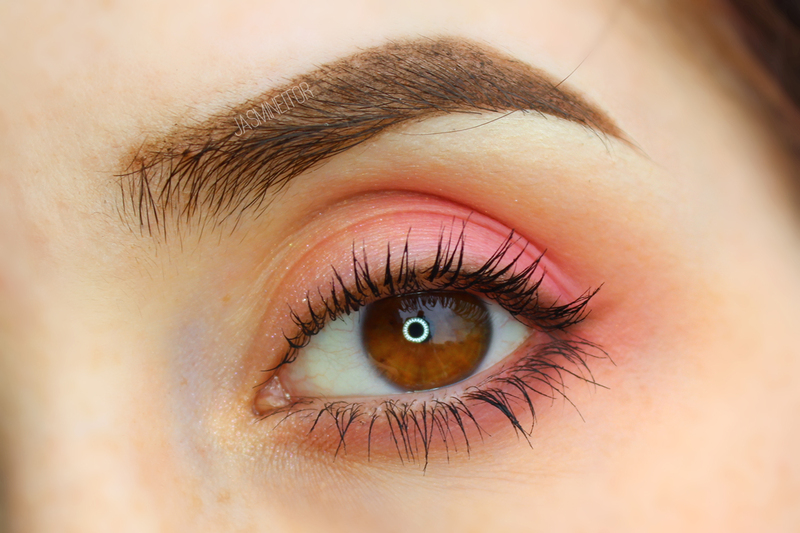 You can see it did not smudge or lose its curl, even if my lower lash mascara did! HOWEVER. After putting this on, every time I would touch my eyelashes they would feel like they were being ripped out. When I tried to remove this later with the Curl Fix mascara remover, nothing happened! I then tried with a Japanese cleansing oil, a cleansing balm…nothing. No matter how gentle I was, my eyelashes hurt so badly and felt like they were being ripped out (I lost 5+ lashes), my eyes were burning and became very swollen and bruised looking for a few hours after. 3 days later and I still have mascara left on my left eye, and I haven’t been able to wear makeup since then as I still have itchiness and what looks like hives on my eyelids. 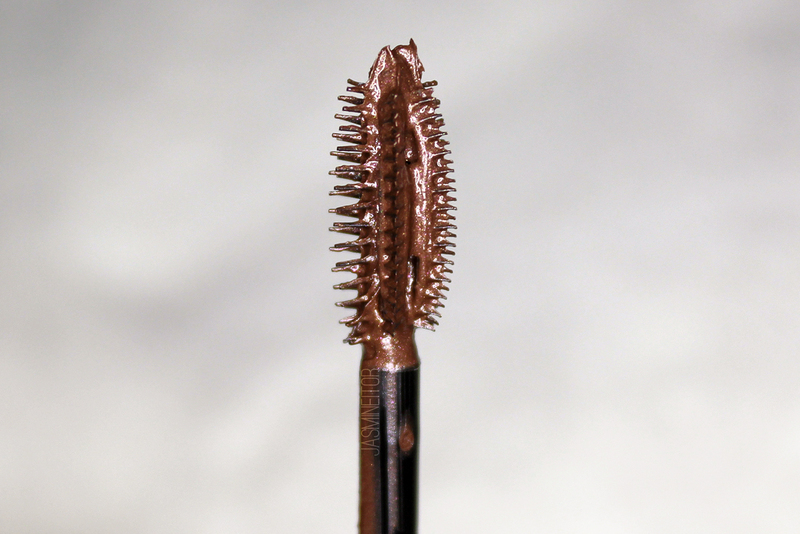 I have never had this problem with mascara before. 🙁 Will either be giving this away or getting rid of it, which is a shame because I did like the colour. 12,000 KRW for 8g. 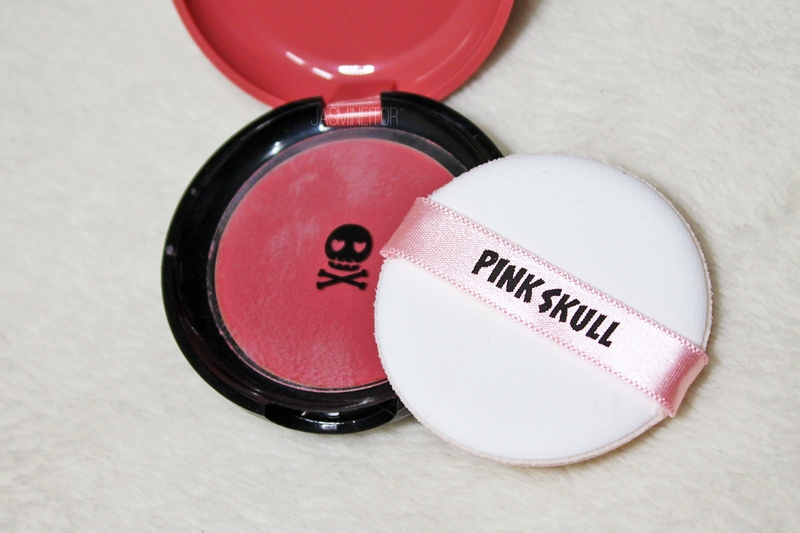 The Pink Skull blush comes in very simple, slightly cheap-feeling packaging. The previous photo is more true to colour than this one! 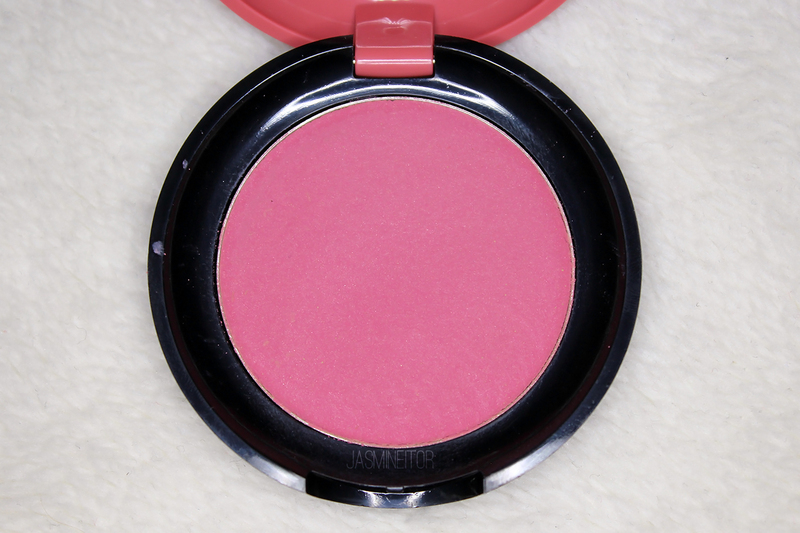 This blush is the cream type, and can be applied either with your finger or by tapping the puff onto the product and then onto your face for a light, buildable finish. The colour is very pretty, and nearly identical with my natural flush (as you will see in the face photo below). It goes on quite sheer at first but is easy to build up. It does not last very long (a few short hours), but as it is portable it is easy to reapply if necessary. 8,500 KRW for 6g. 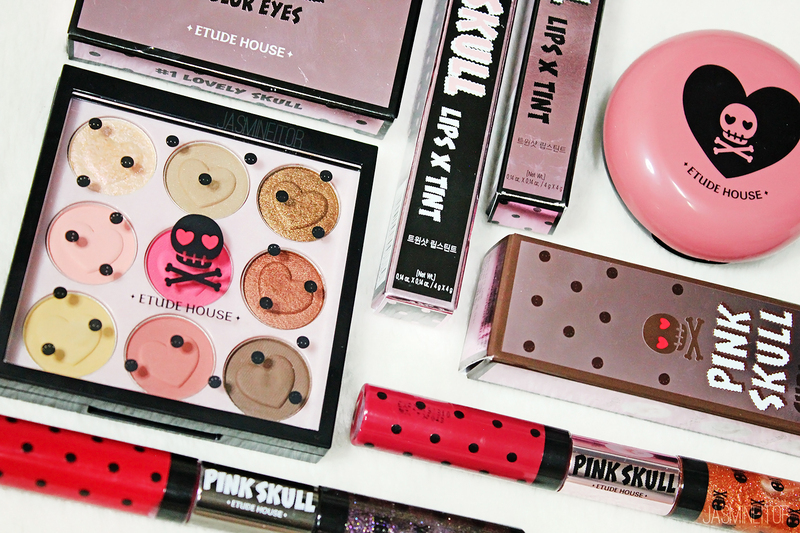 Besides the palettes, these are the products I was the most excited about! 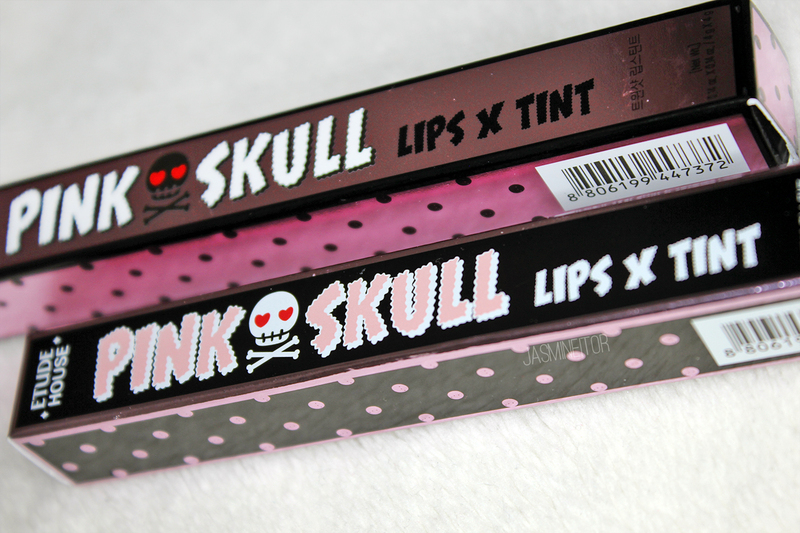 These come in PK003 – Pink x Pumpkin Shot (bottom), and RD304 Punky x Skull Shot (top). 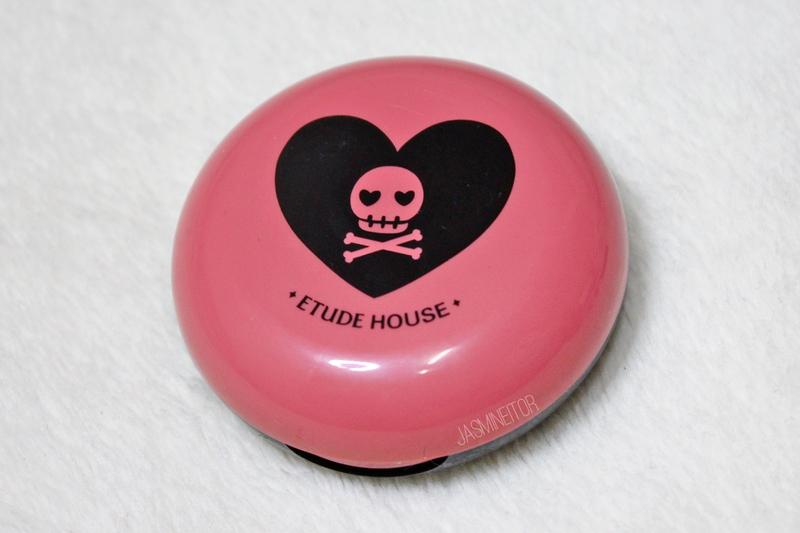 I don’t think I have ever bought a lip gloss type product in K-Beauty, as lip gloss was never something I was into until very recently (gloss covers my dry lip struggles), but I was so pumped to see that Etude House released a BLACK gloss. Korea has been getting more and more bold with colour choices lately!! 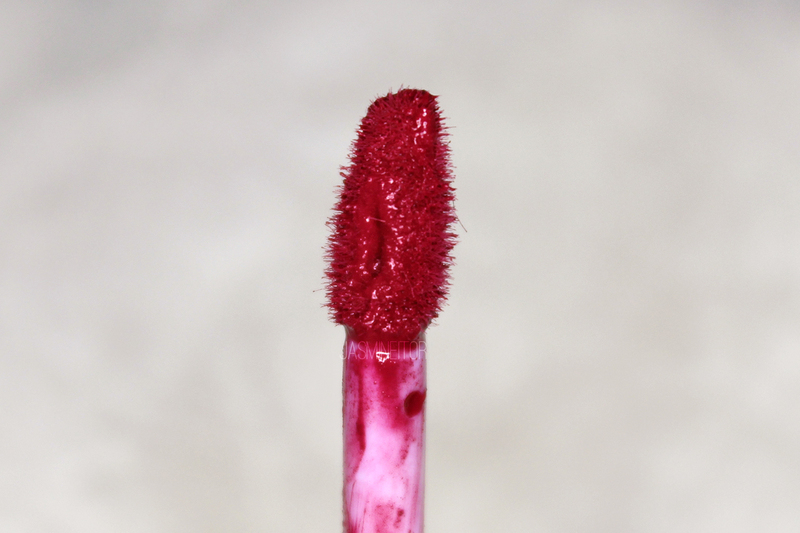 The mousse-tint side has a standard doe foot applicator. 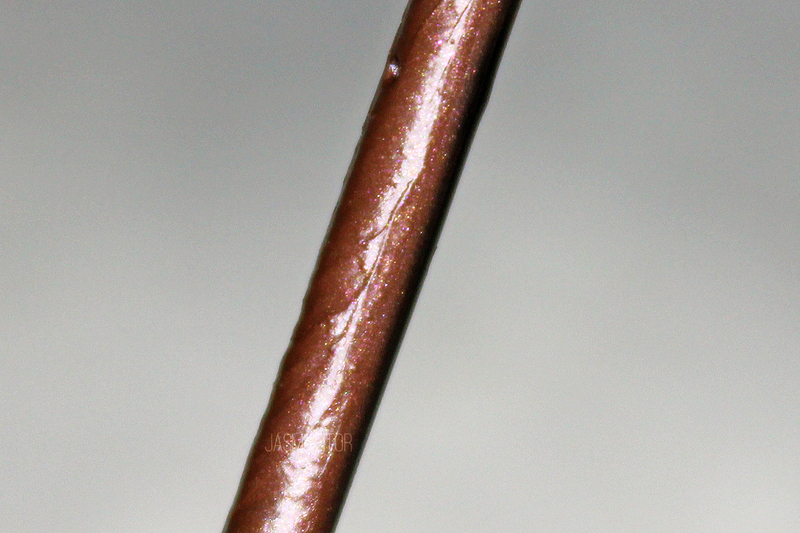 The gloss side has a stiff paddle-type. 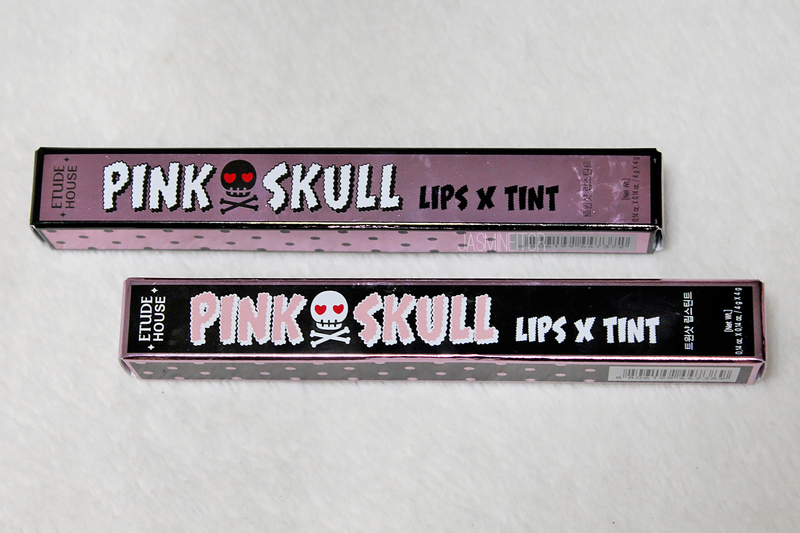 PK003 Pink x Pumpkin Shot is a cool toned deep pink, while RD304 Punky x Skull Shot is a strong pinky red. 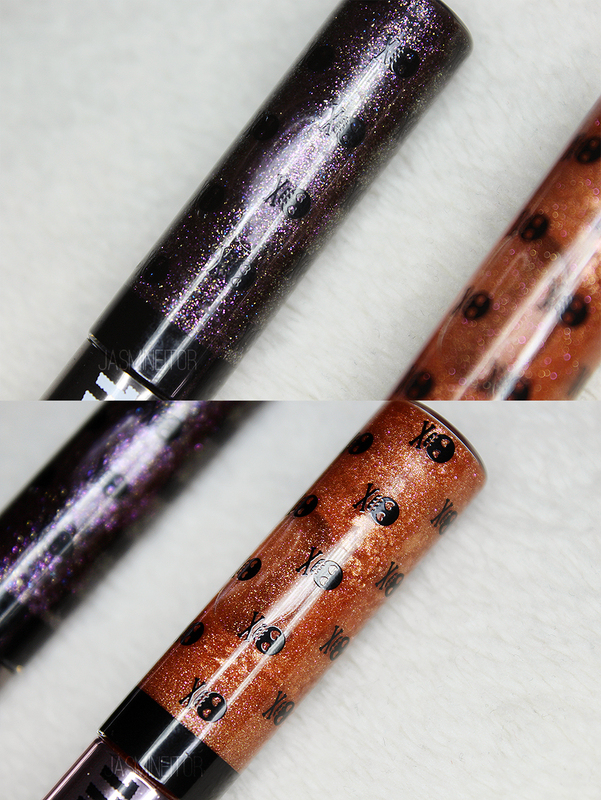 RD304 is a blackened purple base with blue, gold, and purple glitter. 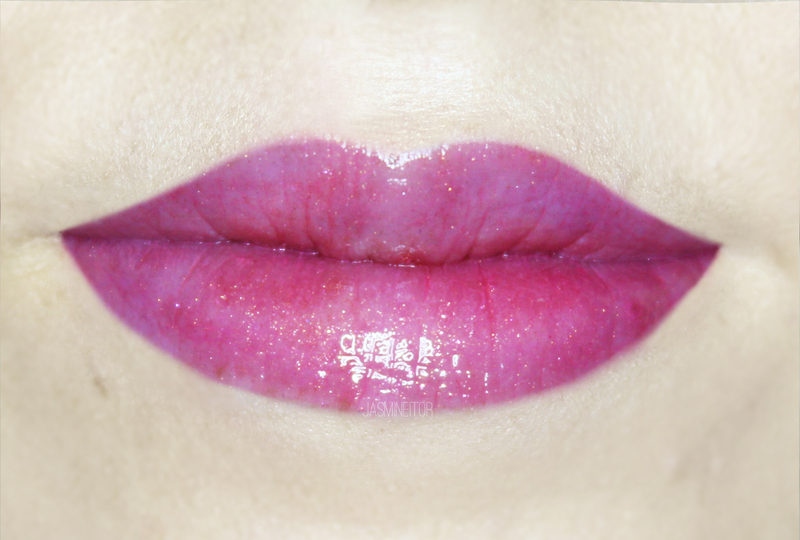 PK003 is (surprisingly) a pink base with sheer copper shimmer and pink glitter. 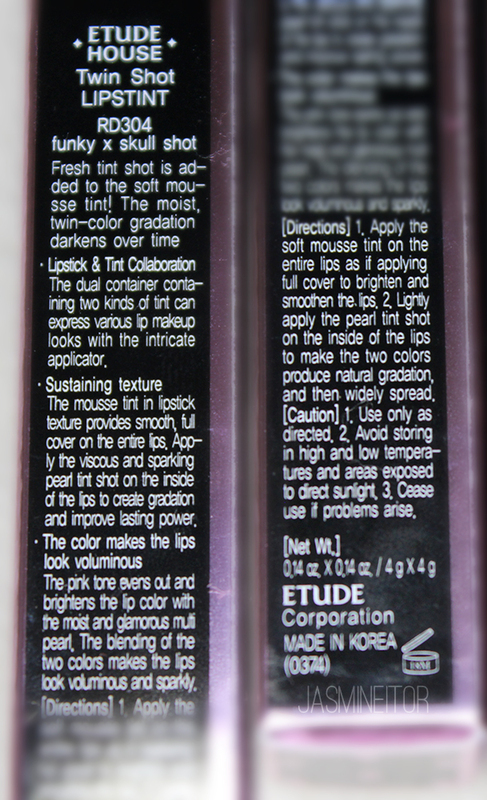 Once again my genius professional blogger self reviewed them in the wrong order, but I was just so hyped about the purple/black gloss that I reached for it first while swatching. 😂 The glitter is more noticeable in the swatches than it is on your lips, but you can definitely see it on your lips when they hit the light as you will see below! 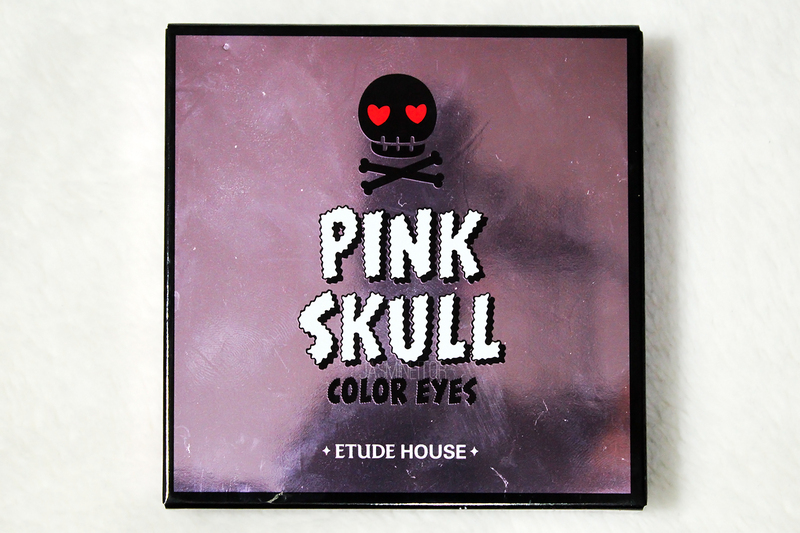 The product is very pigmented so little product is needed for this effect! 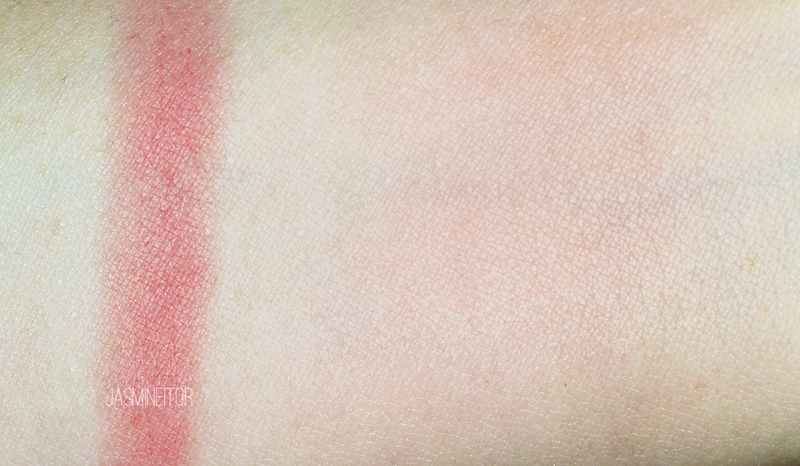 This leaves a velvety texture and doesn’t click to dry patches at all. It actually makes my dry lips look smooth and even! 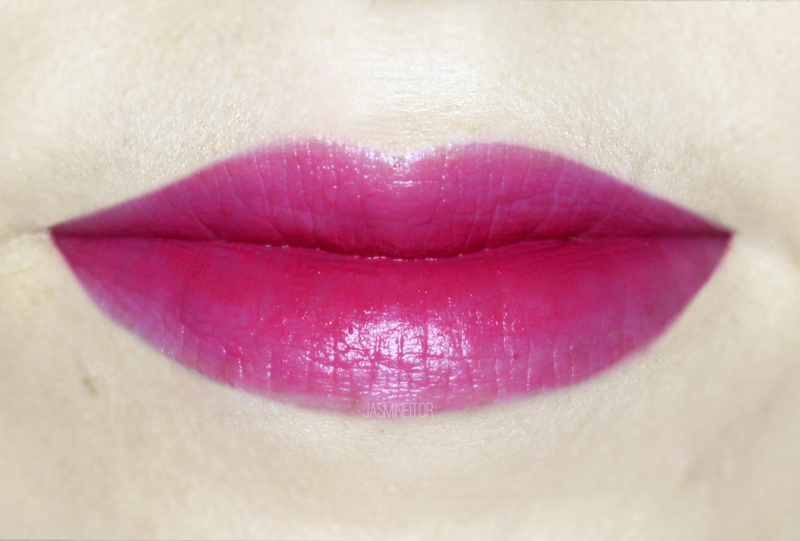 This product makes your lips look SO plump and juicy. The gloss is not sticky at all, so it might fade quicker than a stickier gloss, but I prefer this as sticky glosses stress me out 😂. 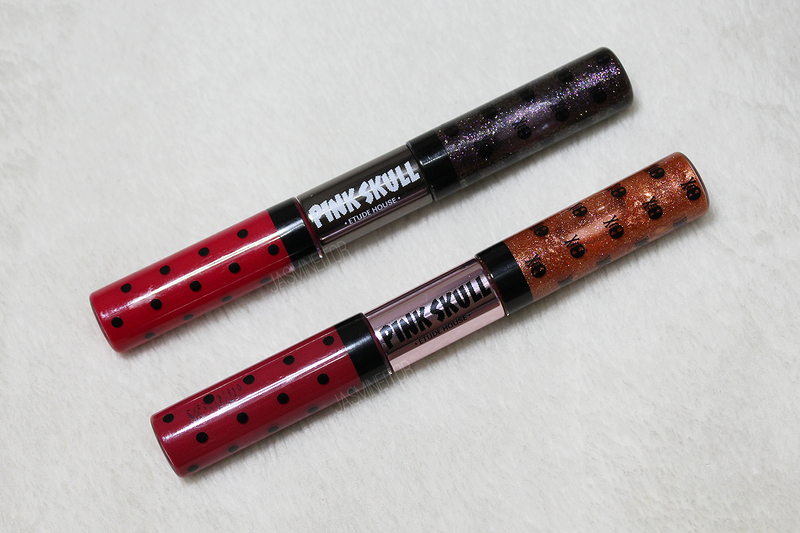 As you can see, the gloss has a pinkish tint; it still has a gorgeous sheen even by itself! 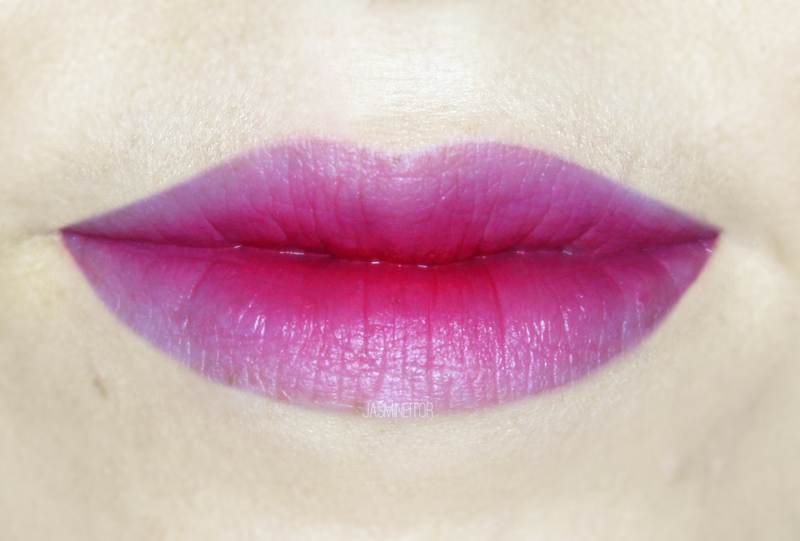 These glosses are called “Pearl Tint Shot”, and just like the name suggests, leave a stain on your lips. 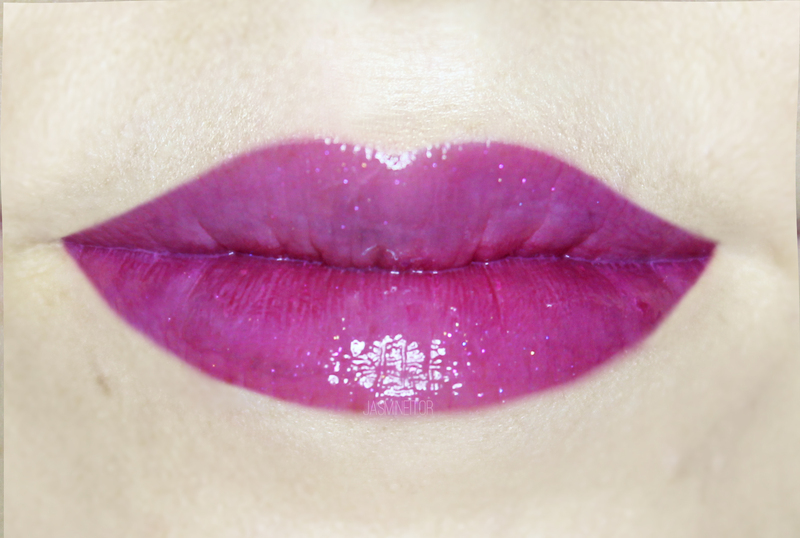 When adding too much of the lip product and gloss on top you may get some bleeding, so I recommend going in with a light hand – a little goes a long way! This is the colour I bought myself. I couldn’t resist getting it with how gorgeous and unique the gloss looked. This colour is much more vibrant than PK003. VERY strong when used as a full lip. 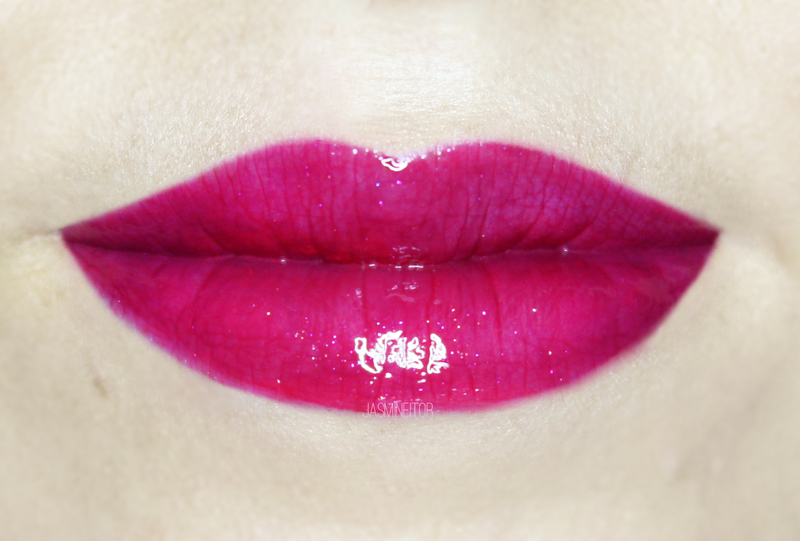 The gloss darkens any lip colour it is applied to, which makes it so versatile. It’s very shiny and dark and I looooove it. 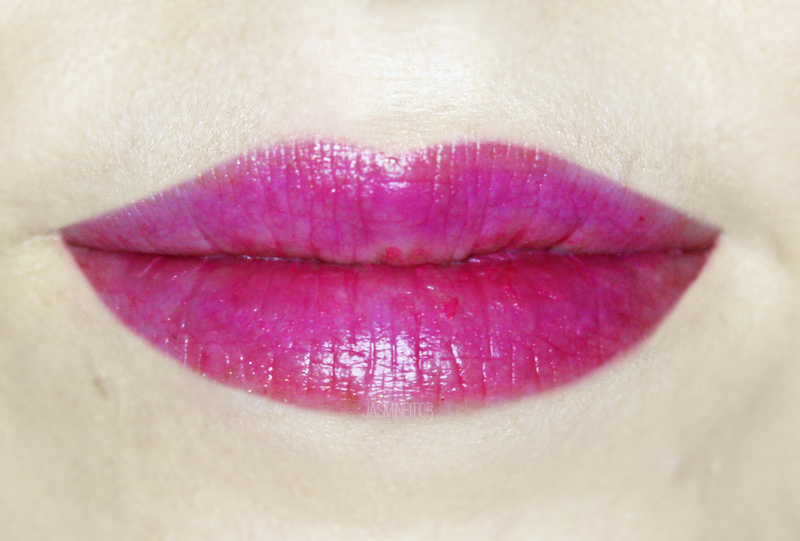 This is what my lips looked like at the end of the day, after several drinks and meals, without reapplication. 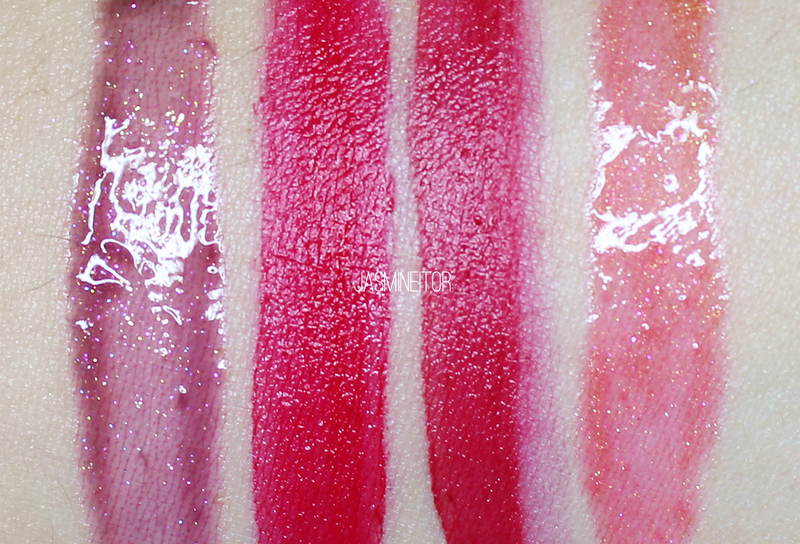 Yes, they look scaley and awful but that just goes to show how well the products cover that up in the previous photos! 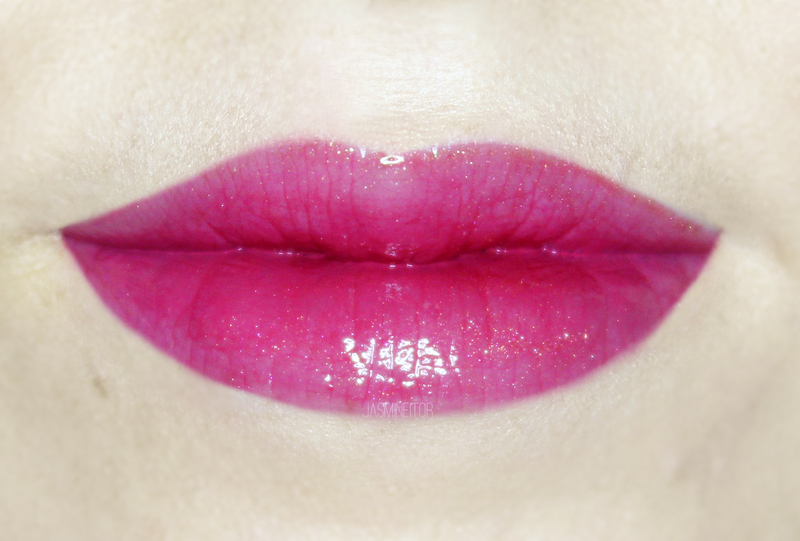 You can see that my lips are still shiny and have a strong pink sheen to them. When viewed in regular lighting, the patchiness is barely noticeable. All in all I am IN LOVE WITH THESE. 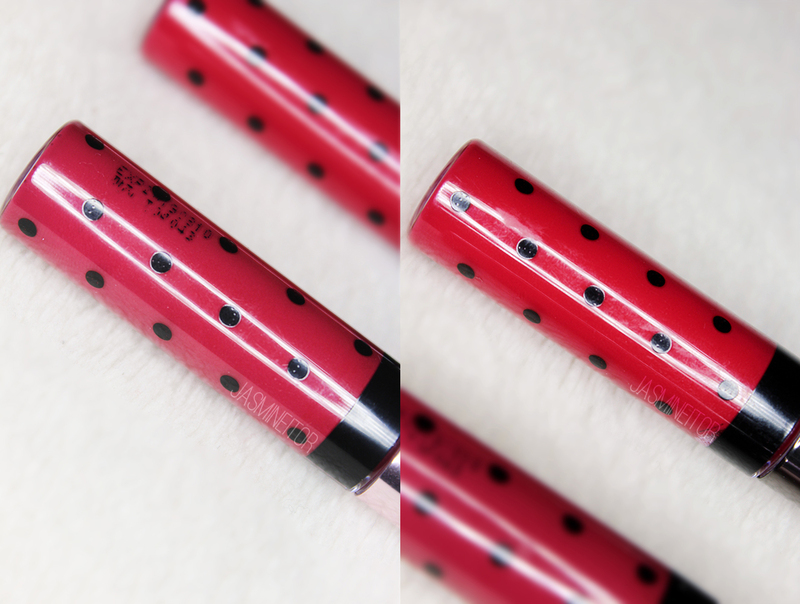 I prefer these infinitely to the regular Twin Shot Lips formula, as these are much less streaky, more moisturizing, and leave a flattering tint that stays on your lips all day. 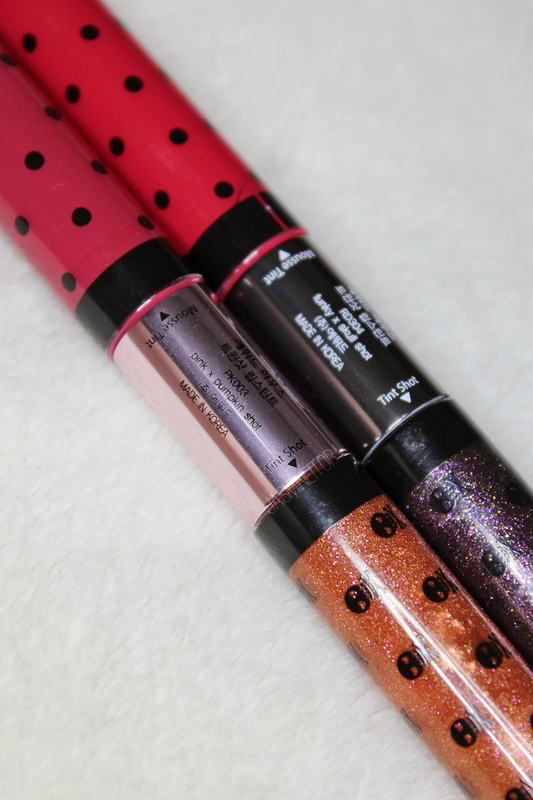 I’ve also been using the glosses with other lip products and they are so flattering! 100% recommend. 😀 12,000 KRW for 4g x 4g! And here it is in all its glory! 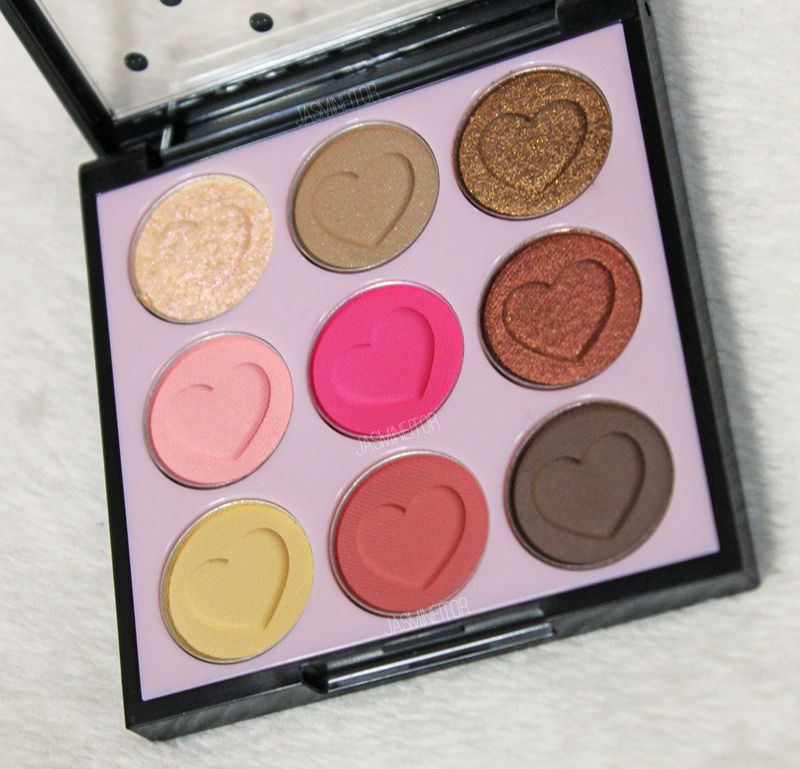 This palette comes in 2 varieties, but as I own so many burgundies already I figured this would be the better choice. 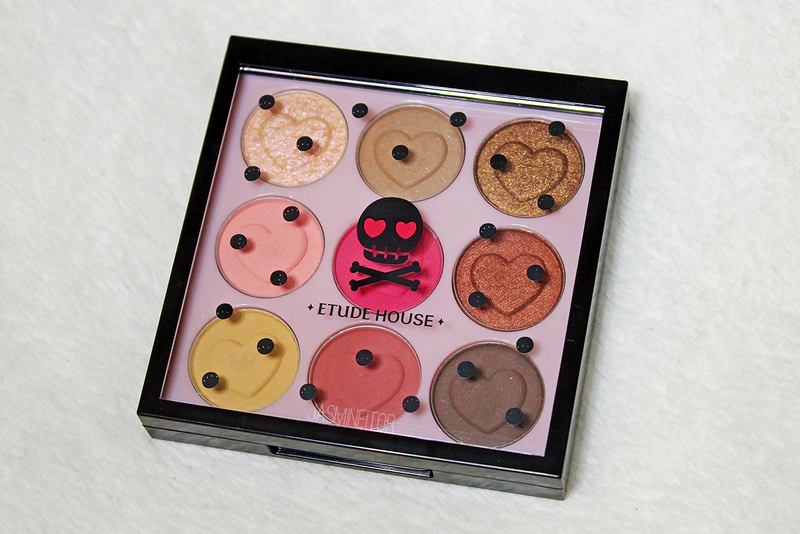 The palette is very tiny and compact, and it looks super cute! 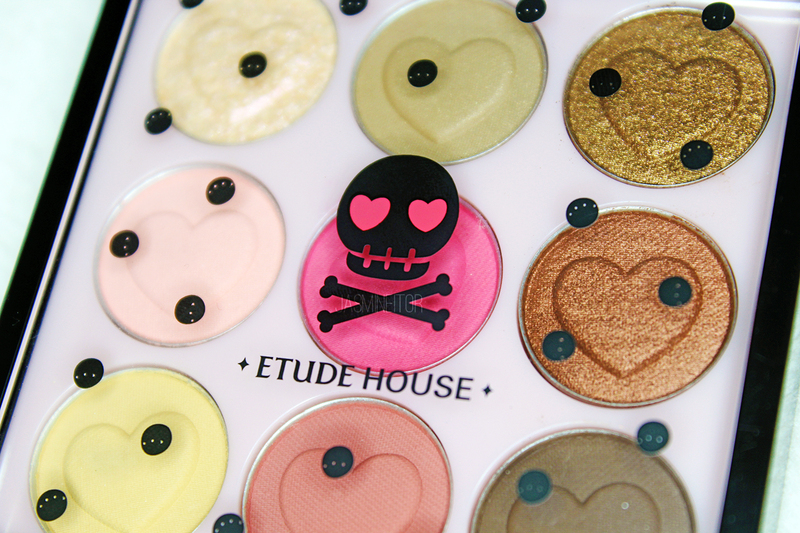 It comes with 4 mattes, 2 semi-shimmers, 2 shimmers, and 1 glitter shadow. 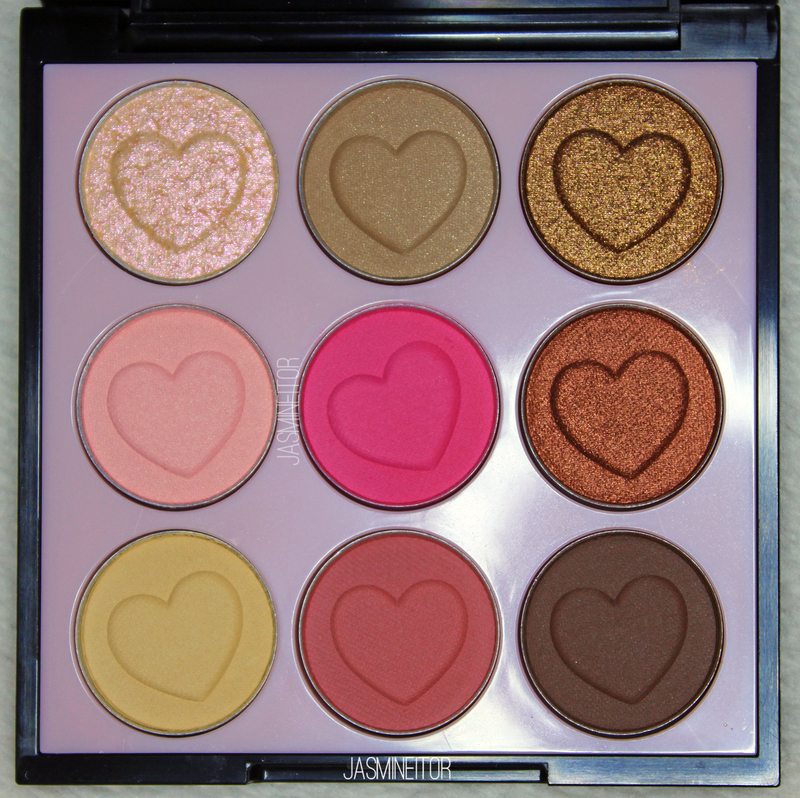 My personal favourite is the shadow in the bottom middle row, Rose Pink-Brown!